Gareth Bale’s not a difficult player to dislike. Akin to the same reasons people hate his team mate Ronaldo, the Welshman possesses good looks, great skill, loves to take a dive, and that good awful stupid annoying heart celebration! Here are the top ten reasons people hate Gareth! He possesses such great skill and cannot offer any of his services but to Wales. Admirable, but annoying. In these Euro qualifiers he has been an absolute joy to watch as the small country races towards qualification for the tournament. He should have played for England, how good does he think he is? 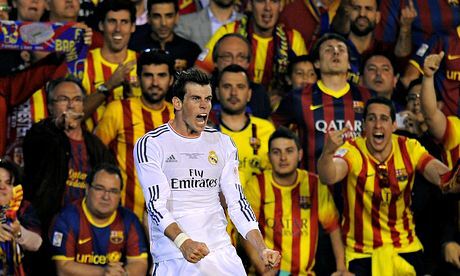 Gareth loves to make a point stick, especially when scoring in an important fixture. He takes a certain glee in showing off in front of the opposition fans, turning his body and showing his name. Ouch! I would be sticking my middle finger up at him as well. Really, who does he think he is?